You can see why they put the one on tv and not the other. Every week 250 lucky American consumers are quizzed on their thoughts about the economy, the “buying climate” and their own personal finances. 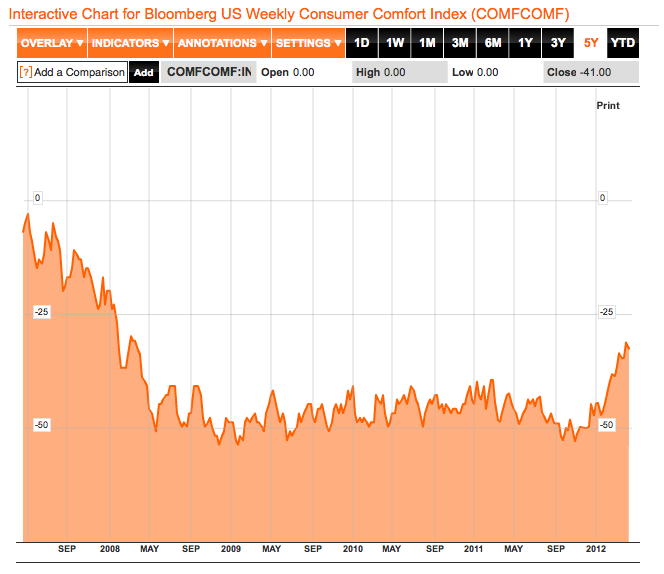 The result is called the Bloomberg US Weekly Consumer Comfort Index, or COMFCOMF if you’re sitting at a Bloomberg terminal, and for the last five years the response has indicated consistent discomfort. What’s behind the recent jump in sentiment? We don’t know either but if you find out put it in the comments.